Purchase your Joey Henson map of Buckeye Knob now! All proceeds help us pay off this sweet boulder field! Fantastic boulders located just outside of Boone. Comprised of 2 main areas, the upper Buckeye Knob boulders and the lower Barn boulders. Buckeye Knob is more of a back country experience, with a long (30 minutes) approach and a solitary feel. The Barn boulders are close to the road and concentrated in a small, circuit-friendly area. From Boone, take 421 North for about 8 miles and then turn left on Walls Road. Take a right on Joe Shoemaker Rd and after 1 mile, turn left onto Silverstone Rd. 0.5 miles later, turn left onto old US 421 and then right on Laurel Branch Rd. Follow Laurel Branch Rd for 0.7 miles and then look for a barn on the right with skis on the side of it. There is a steep, one lane paved driveway that goes up a hill just left of the driveway for the barn, take that and then take a right on the first gravel road just about 100 feet up the hill. Stay right at the fork and follow that a short ways to an obvious set of parking spots (go slow, this road is rough in spots). Pull off in one of the spots and please don't block the road / driveway. If the parking area is full, you can park along the side of Laurel Branch Rd with your wheels off the road and not blocking any entrances. You'll see a sign and blue flagging directing you to the trail from the parking area. Follow the trail from the parking area up the valley and then left and over a small ridge to the Barn boulders. The Buckeye Knob trail is harder to follow beyond the Barn boulders, we recommend either going with someone who knows the area or waiting until we get the trail better established before venturing to the Knob. High quality bouldering on solid stone with problems ranging from V0 to V13. Slabs, overhangs, aretes, cracks, this area has it all. 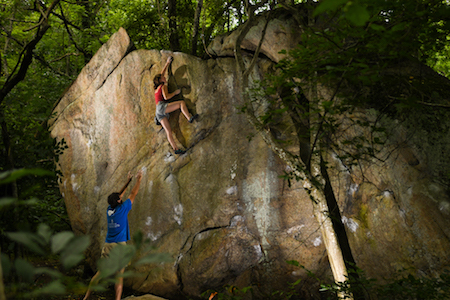 There are a number of classic lines and a concentration of high-quality and diverse problems in the Barn boulders and more spread out and occasionally highball lines on the Knob. Camping is not permitted at the boulders or in the parking area, this is a day-use area only. There is no guidebook at this time.